Cupping Therapy is an ancient Chinese method of massage, ease fatigue, improve blood circulation etc. 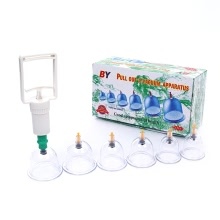 This cupping set is made of PS material, solid and safer to use than glass ones. Equipped with vacuum suction handle to adjust pressure on your needs. Don&apos;t hesitate to buy it! PS material. non-toxic and anti-break. Well-sealed vacuum cups, not easy to fall off or drop when used. Top valve for easy pressure release. 6 sized cups: Interior Dia.2.2";1.8";1.5";1.3";0.98";0.7". Equip with vacuum suction handle to adjust pressure on your needs. Safer than glass cups, no need of fire. CE approved, high quality product. Exterior Diameter: 6.7cm / 2.6" ; 5.8cm / 2.3" ; 5.0cm / 1.9"; 4.4cm / 1.7"; 3.2cm / 1.2"; 2.9cm / 1.1"
Interior Diameter: 5.6cm / 2.2"; 4.7cm / 1.8"; 3.8cm / 1.5"; 3.4cm / 1.3"; 2.5cm / 0.98"; 2.0cm / 0.7"